2019 is here, and with that a whole new wave of kitchen appliance trends is on the way. Today we decided to give our list of kitchen appliance trends you should be looking out for. Induction cook tops are the perfect combination of sleek design and modern technology. Sporting a clean looking glass top induction cook tops utilize electromagnetic fields to heat up magnetic objects on it’s surface. Due to the way energy is being transferred, there is less energy and heat loss and it is able to heat up your meals even faster! Using these electromagnetic fields induction cook tops don’t heat up the surface of the glass, only the magnetic surface on it. This means that your cook top is safer as you won’t burn yourself if you accidentally touch it. It does however mean that you need induction compatible cookware. If a magnet will stick to it, you are good to go! Each year technological integration into our daily lives becomes bigger and bigger. In 2019 we expect to see technology make a major push into the kitchen appliance scene as well. Many companies have been making tech enabled products to make your kitchen living easier. Come see the Bosch Wifi Enabled Coffee Maker in our showroom! For example, Bosch has a wifi enabled coffee maker with a touch screen interface. You can program your custom cup, set up automatic timing, and much more. Miele has a new line of range hoods called the Con@ctivity 2.0 that automatically adjusts it’s power based on how you are using your cook top. Pretty cool huh? Tall column refrigerators are another growing trend moving into 2019. Not only are they sleek and stylish, but they also allow you to get the most out of the space in your kitchen. 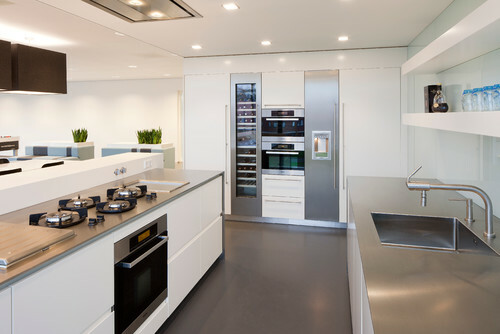 Tall column fridges allow for a sleek and seamless look that fits right in with your cabinetry. You can go with a stainless steel or other finish to make your fridge pop, or you can make them flow seamlessly with your kitchen and design the doors to look like your cabinetry. The taller refrigerator also allows you to get more out of your fridge as the unit doesn’t have to be as wide to have the same amount of space as a normal refrigerator. This last one isn’t just an appliance trend but also a kitchen design trend. While the look of an all white kitchen can be appealing, the industry is starting to move away from white and starting to add more color in the kitchen. Using more natural oranges and wood tones, blues, browns, and blacks give more pop to the kitchen. We are even seeing appliance manufacturers catch on as well. Moving away from the standard stainless steel look, some companies are adding gold and copper features on their appliances, or even brown finishes. Want to remodel your kitchen and use some of these appliance trends in your kitchen? Get in touch to schedule an appointment with one of our appliance experts today!